Once thermometers climb above freezing Friday morning, they will not return for at least the next week. A mild weekend is ahead with only isolated showers possible until a cold front brings more organized rain and storms Sunday night. Today and Tonight: Friday will warm significantly, reaching highs in the 50s by afternoon. Winds will shift to a primarily easterly direction and be lighter at about 5mph. Some sunshine is expected again, but clouds are expected to increase around the region unlike Wednesday and Thursday. Overnight will be mostly cloudy with lows in the low 40s. Up Next: Saturday morning will be above freezing followed by a mostly cloudy afternoon in the upper 60s. Do not sleep on the possibility of a stray shower. Fog will be a nuisance in Sunday morning and then thermometers will stretch for the 70s. 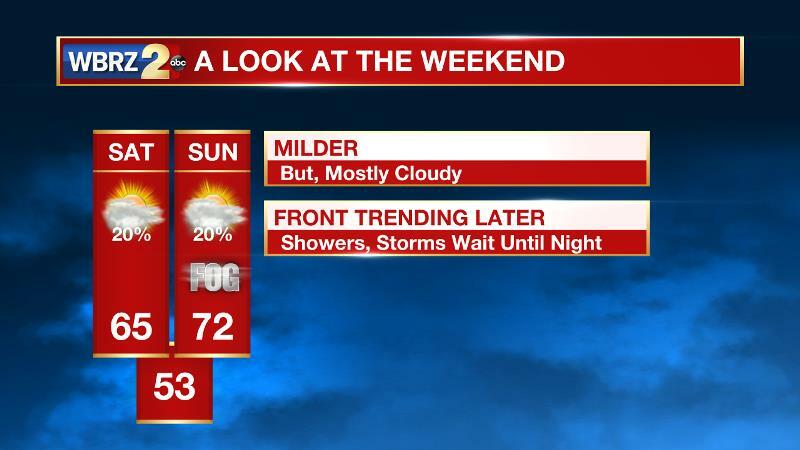 Previously, it looked like a cold front would bring showers and thunderstorms Sunday afternoon but it now appears that the front will arrive overnight allowing rain to hold off until later and into Monday morning. That cold front will clear the area Monday afternoon and temperatures will not be nearly as cold on the other side of that one. An area of high pressure eon the surface will continue to push farther into the Southeast U.S. through Saturday. This will prompt onshore flow and a continued warming trend putting an end to the frigid spell. Late Friday into Saturday a shortwave trough well move across the Texas coast and into the northern Gulf of Mexico. This shortwave trough will result in southwesterly flow aloft and in coordination with southeast wind at the surface, moisture advection will be underway at all levels. While initially, the air mass will be too dry for precipitation, the longer this wave lingers over the region into Saturday, the more possible an isolated shower will become. At the very least, there should be a significant increase in cloud coverage. After the wave departs and southeast winds continue, the fetch of warmer air over relatively cooler nearshore waters will result in the development of fog. Depending on the strength of winds, fog may emerge well inland reducing visibilities on Sunday morning. The next and more vigorous shortwave will be moving into the Mid-Mississippi River Valley by this time. Warm air advection ahead of that feature will allow highs to make a run at 70 degrees on Sunday. Forecast models have slowed the timing of the front associated with that trough and therefore it appears as though rain and thunderstorms will not be an issue until Sunday night or Monday morning. The basin of the trough will stay well north and the tilt is more neutral, so locally, severe weather does not look like it will be an issue. Following that front, thermometers will be near average Tuesday and Wednesday with no freezes anticipated.